On this day in 1899 Michael J. Heney lost an invaluable colleague. Hugh Foy literally worked himself to death on the construction of the railroad and died at the summit of pneumonia. Foy was born on July 15, 1842 in Aroostok Maine. He was the construction foreman for White Pass. Seen above he is the only one smiling, on the far left. He died doing what he loved – read the obituary below. Another home has been rendered desolate by the sudden visitation of death, and and those who have been so long associated with Hugh Foy will see him no more for he has passed away and hereafter there will be only his memory to remind the of a sturdy character full of noble attributes the like of which it will be hard to find. Hugh Foy died at White Pass at 2:30 yesterday morning after an illness of only about three days and during none of which his condition was deemed critical. While suffering from pneumonia the direct cause of his death was valvular heart trouble which was aggravated by pneumonia. He was known as a man of wonderful endurance, notwithstanding his age, which was sixty-seven (crossed out, written fifty seven) years, and he would go out at any time of night and in all kinds of weather. It was in one of these when called out one night last week that he caught a severe cold which brought on pneumonia and ended fatally yesterday morning. The dead man born in the state of Maine and leaves a wife and six (crossed out, written four) children the latter all grown up, three (crossed out, written two) boys and three (crossed out, written two) girls. Mr. Foy leaves considerable property, much of it in Seattle where he owned a beautiful home on Queene Ann Hill now occupied by his family. Mr. Foy was also closely identified with the San Francisco Bridge Company, and is said to own considerable stock in the company. He also has a son connected with the same company who lately returned from South Aemrica where he erected some machinery. Mr. Foy is a man of great physical endurance and it is said of him that his body is full of scars from wounds received in wrecks, explosions and other casualties,. His valvular heart trouble is said to have its origion in these numerous shocks. Some time ago Mr. Heney urged him to take a vacation of sixty days, telling him he had earned it, but Mr. Foy positively refused saying he would not leave until the road got to the Summit. A week ago last Monday he it was who welcomed the one hundred excursionists on the Summit of White Pass and did much to make it pleasant for all the guests on the occasion. Today he has passed away. The Summit for him has been reached and from the summit his record for integrity and worth will shine like a beacon light for the world of workers to emulate. The remains were brought to Skagway yesterday morning on a special by Supintendent Whiting and Dr. Whiting, and taken to Peoples’ where they will be embalmed ready to be taken down to Seattle on the Rosalie, the same steamer that took down the remains of R. B. Jack. Governor Hoggatt was born in 1865 in Paoli Indiana. Maybe his parents thought that giving him a name that brings up visions of a pig would make people smile. 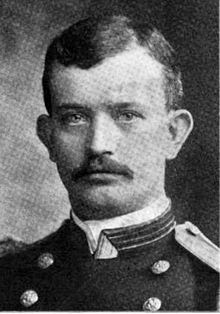 He graduated from the United States Naval Academy in 1884 and remained in the Navy for 18 years, including service during the Spanish-American War. Hoggatt was a member of the Arctic Brotherhood and became Governor of Alaska from 1906 to 1909. During his term Hoggatt was responsible for relocating Alaska’s government from Sitka to Juneau, where it has remained ever since. In 1925 he moved to New York City, where he lived in retirement. He died on this day, November 26, 1938 in the Bronx, New York. I am tempted to say he choked on a ham sandwich, but no, just complications of old age. “Harry” Woodside was born in Arkwright, Ontario, Canada in 1858. He was one of the earliest white men to arrive in the North. In 1892 he was the census enumerator for the Yukon. Later he became the editor of the Yukon Sun in Dawson during the Gold Rush. His photographs from this period provide a considerable portion of the recorded visual history of the Gold Rush. He took the photo above of Dawson with Lousetown in the foreground. Woodside left during the Boer War and volunteered for service in one of the Canadian contingents. He was given the rank of Lieutenant in the regiment and was about to sail from Halifax on the transport with the regiment when he was thrown from his horse in cavalry practice and nearly killed. He was in the hospital for weeks and while there was nursed back to good health by a nurse who later became Mrs. Woodside. Major Woodside sailed for Africa to join his regiment after he had gotten out of the hospital. He got as far as Durban, South Africa when the war terminated and he was ordered home. In 1904 he went to join his wife in Winnipeg. He served again with the rank of Colonel in World War I in the 5th Regiment, Canadian Mounted Rifles, and was wounded in France in May 1916. Woodside died in November 8, 1929, in Ottawa. The Fairbanks News reported his death on February 25, 1930. Dawson Daily News Aug 27, 1904; Wikipedia; Canadianmysteries.ca; Fairbanks news list. Ontario Death Registration. Martha Black is well known in the Yukon. Although she was reported to be the first woman to cross the Chilkoot Trail, she was actually the 5th (first was “Dutch Kate” Wilson in 1887, 2nd was Bell Healey in 1888, 3rd was Emilie Tremblay in 1894 and 4th was Jesse McDougall in 1895). Martha Munger was born on this day, February 24, 1866 in Chicago. When news of the Klondike gold discoveries reached the Outside, Martha and her husband Will Purdy made plans to head North. At the last minute, however, Will Purdy got a better offer to go to Hawaii. Martha was determined to break away from the straight-laced life she had led, and continued on without him – she was never to see her husband again. Martha left Dawson for a year, but returned in 1900, when she joined a mining syndicate. The following year, her father arrived with the machinery to set up a sawmill, and a stamp mill for assaying the ore from quartz mines which were being developed. Martha was put in charge of the mills, and when she needed a lawyer, George Black came highly recommended. Within 2 weeks George had proposed marriage, but Martha held off for over 2 years. They were finally married in Martha’s large home at the sawmill on August 1, 1904. George was elected to Parliament in 1921 and served until 1935, when he was forced to resign due to ill health. Martha then ran in his place, and at the age of 69, she became only the second woman ever to be elected to Canada’s Parliament. If you go to Whitehorse there is a beautiful “May Day” tree just off of 2nd by the city office building. The placque there says that it was Martha Black’s tree. In the spring when it blooms with hundreds of fragrant white blossoms, it is a beautiful reminder of a great lady. Martha died in 1957 in Whitehorse. John Hislop was the first Mayor of Skagway and President of our City Council from 1900-1901. He was a former High School teacher and came to Skagway from Cripple Creek, Colorado. He became the White Pass Chief Engineer and surveyor working closely with Michael Heney. John was born in 1856 in Galt, Ontario Canada and his father also worked on the railroad as a section foreman. On February 22, 1901, in Chicago the tragedy of John’s death brings tears to my eyes. Standing on the platform for the train, getting ready to meet his bride, his jacket caught and he was thrown under the train and killed. He was 45 years old. 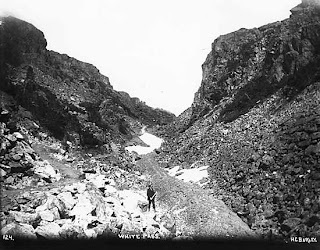 The Barley photo above shows a WP official, probably Hislop surveying the White Pass summit for a route to build the railroad. 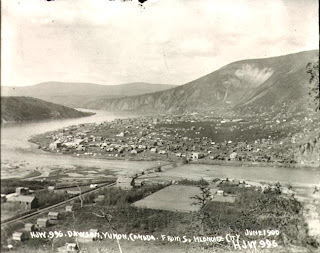 1881 Canadian and 1900 Skagway census; Goldrush website; Skagway News; Cy Warman; Mills; Minter. In February of 1898 Archibald John Campbell, a Scot, came to Skagway to be the Episcopal Minister and dubious doctor. There was some controversy about Dr. Campbell. When Presbyterian Minister John Sinclair came to Skagway in 1898 from Ontario, Canada, he found that the Reverend Doctor Campbell was firmly ensconced in the Union Church, that had been built in 1897 by Rev. Dickey. Campbell did not welcome Sinclair and told him the Union Church was Episcopal and refused to move out. Sinclair had been sent by Bishop Rowe because of odd allegations against Dr. Campbell. Campbell was later fired by Bishop Rowe because of allegations of misconduct with females by a neighbor, George Aggers. Aggers and others said women were seen coming and going from the Reverend’s home at all hours of the night. The women supposedly were coming to Dr. Campbell for his famous internal massage or liver therapy. After some months of dispute, Campbell moved to a cabin on the hillside where he apparently was quite agitated and died on this day, February 22, 1899 of a heart attack. “we…divided our goods into seven packs and engaged five men and two women to carry these loads to the summit of the pass… The Indians supported the loads on their backs by the aid of deerskin bands, passing across the forehead. Several children carried on their backs light loads, consisting of food and cooking utensils for the use of the Indians, while two of the dogs also wore packs.” from Over the Chilkoot Pass to the Yukon, Scribners, November 1896. After leaving here he joined the Cuban Revolutionary army and fought for independence there – see him in the Cuban uniform above. 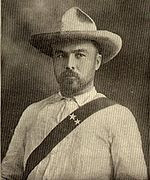 Funston later fought in the U.S. Army in the Phillipines in the Spanish American war of 1898. For his bravery he was awarded the rank of Brigadier General of Volunteers and the Medal of Honor. Fort Funston in the San Francisco area is named for him. On this day, February 19, 1917 while relaxing in the lobby of a San Antonio, Texas hotel, Funston was listening to an orchestra play The Blue Danube Waltz. After commenting, “How beautiful it all is,” he collapsed from a massive painful heart attack and died. He was 52 years old. 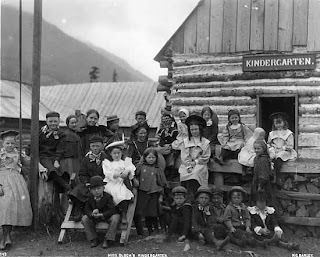 On this day, February 18, 1991 Mrs. MacMillan, a schoolteacher in Skagway in the early part of the 20th century, died in Washington. She was born in 1902 in Skagway, the daughter of Minor Ellsworth Rogers, a White Pass carpenter who came to Skagway in 1897 and stayed until his death in 1958. Ellen’s husband was John Roderick MacMillan. They both died in Redmond Washington. Ellen is not to be confused with Elma Kyle McMillen who was also a long time schoolteacher in Skagway from 1960-1981. Elma passed away in Whitehorse in 2002. Mr.Muehleisen was born on this day, February 17, 1907 in San Diego, California. He loved airplanes and even helped to build the Spirit of St. Louis for Charles Lindbergh’s historic 1927 solo non-stop New York-to-Paris flight. His sad connection to Skagway was that on January 30, 1935 he crashed his plane here in Skagway and died and is buried in the Skagway Pioneer’s cemetery. Pictured above is Muehleisen in 1927 with his co-workers who built the Spirit of St. Louis. Sophia was the daughter of J. Frederick born in 1895 in Juneau. She married William Clarence Matthews, a Tlinkit who was a farmhand in Dyea at the turn of the century. 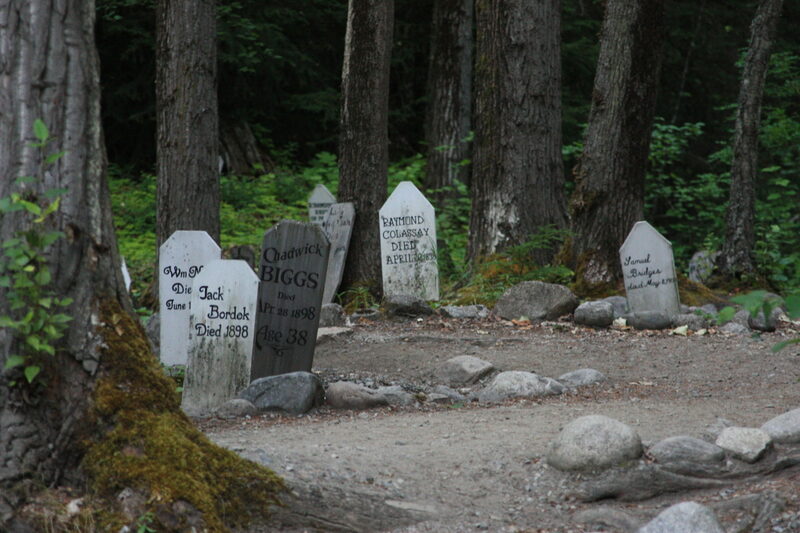 Sophia died on this day, February 15, 1921 in Skagway and was buried in the Dyea Cemetery. Why she died at the young age of 26 is not known, but many women at that time died in childbirth or shortly thereafter. What we do know is that Mabel, her 8 year old daughter died in 1920 and Julia, her one year old daughter died a month later in April 1920. Perhaps she died of heartache. All three are buried in Dyea. Some of the people buried in the Native Dyea Cemetery that was being washed away by the river about 10-15 years ago were relocated to the Slide Cemetery. from rootsweb posting, Skagway News and Skagway Death record.